Creation Audio Labs adds to its catalog the Funkulator EQ pedal for funky bass players who want to shape their sound. MXR will launch in March the new M89 overdrive pedal designed specially for bass players. Daring Audio unveiled at NAMM 2013 the HD version of the Laser Cannon distorsion bass pedal, with two available finishes. Bassists will have the opportunity to discover at the NAMM Show 2013 the new EBS Billy Sheehan Signature Drive effect pedal. T-Rex Engineering will debut at NAMM 2013 the second version of its Sweeper chorus pedal for bass. 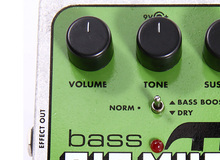 Deluxe Bass Big Muff is the latest in the line of bass specific effects. The new Carl Martin BassDrive is now shipping.